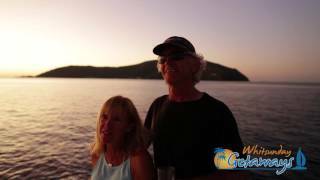 Professional crew to guide you around the Islands, on board accommodation, snorkeling equipment including wet suits, fantastic food prepared fresh daily, fresh linen, daily departures from Airlie Beach, Sail Away No More to Pay. 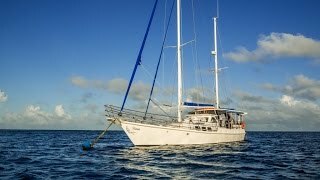 Your sailing adventure in the Whitsunday Islands of the Great Barrier Reef will probably be a once in a lifetime experience, so go on and spoil yourself with a private double cabin on one of their large, comfortable, well appointed yachts. Savour your time at sea in comfort, style and privacy. Many of their private double cabins are fully air-conditioned and some even offer en-suites. 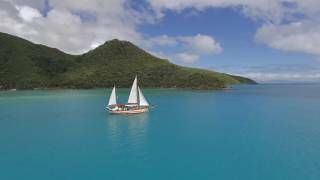 Sail around the Whitsunday Islands aboard a 70-year-old ketch for a full two days/one-night adventure. Sleep in their comfortable air-conditioned vessel and wake to a beautiful island sunrise. They will take you to the best snorkelling locations and with sufficient kayaks for all on board, their friendly guide will take you on an eco friendly exploration of hidden inlets and fringing reefs. Jump on board either of their beautiful catamarans and explore the amazing Whitsunday Islands. They offer two-night cruises for couples, departing six days a week. Both boats comfortably accommodate four couples in private, air-conditioned cabins with en-suites. Your professional Skipper and Host will ensure your wants and needs are taken care of as you sail, snorkel and explore this spectacular playground. Sit back and relax aboard the beautiful classic Waltzing Matilda, with a great reputation for comfort and value. If you are looking to escape large crowds (only 14 guests) Waltzing Matilda provides the full experience. Visit and swim at the world-famous Whitehaven Beach, bush walk to Hill Inlet look out, snorkel the most amazing fringing reefs, relax, run barefoot on an unspoilt beach and anchor at a picturesque bay. Kiana is the only vessel in the region that caters for small numbers to the outer Great Barrier Reef. Explore, dive or snorkel the incredible diversity of the islands and outer Great Barrier Reef. This eco accredited trip offers great opportunities for both certified and first-time divers.